New York, NY—On April 3, 2019, the Columbia University Center for Veteran Transition and Integration (CVTI), Center for Teaching and Learning, and School of General Studies released Attaining Higher Education (AHE), a course on edX.org. The course is free and open to all. 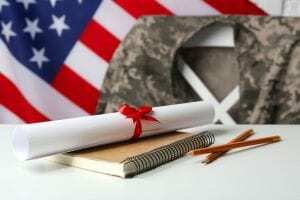 Attaining Higher Education is the third full-length MOOC (massive open online course) designed by CVTI and is specifically targeted at active duty service members and veterans investigating entering the world of higher education. Led by a team of instructors with more than 20 years of experience in admissions, financial aid and transition support services—including helping thousands of active duty service members and veterans—Attaining Higher Education breaks down the process of transition to education and assists service members in finding an educational program that fully maximizes their potential. Once enrolled in the self-paced course, students can choose a variety of pathways through the course materials. This course is also a library of resources, a tool for flipped classroom pedagogy, and finally a textbook for on-the-ground transition courses. The course lectures are short and to the point. These are supplemented by veterans speaking on the topics in segments titled Veteran Voices. Course activities lay out how to approach admissions processes, which can vary significantly from school to school, and guide students through the self-assessment needed to determine if and how to apply successfully to schools that maximize their academic potential and help them achieve their professional goals. From intentional decision-making—a method through which service members and veterans connect their life and military experiences with a potential academic or career path—to choosing a right-fit college, understanding the college application process, and financing their education, this course will provide tangible ways to successfully navigate all of these benchmarks in the transition to higher education. 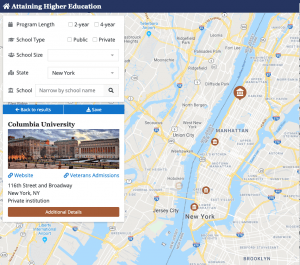 AHE Interactive Map helps veterans make college selections. Leveraging the power of online learning, the students’ work will be collected and compiled in a custom journal and worksheets; participants will make use of an interactive map of colleges and universities with veteran-specific data; and all course assessments will provide immediate feedback and explanations to further aid learning. The most unique component of this course is that participants who complete the course can apply for follow-on peer coaching and professional advisement through a national community of experienced advisors. The Attaining Higher Education online course is available at https://www.edx.org/course/attaining-higher-education. Visit ColumbiaX to keep informed about upcoming MOOC releases from Columbia University. The Center for Veteran Transition and Integration was launched to have a direct and lasting impact on the issue of veteran transition and upward mobility by creating and providing access to the best-in-class tools and programming veterans need as they transition from active service to college and the workforce. CVTI is developing and delivering educational programming through a national community of partner universities, employers, and veteran service organizations committed to facilitating veterans’ upward mobility. The intent is to align and integrate these institutions’ direct services into the mission, operations, and performance measures of CVTI. The Center for Teaching and Learning partners with faculty, students, and colleagues across the University to support excellence and innovation in teaching and learning. The CTL is committed to advancing the culture of teaching and learning for professional development, curricular enhancement, and academic support through its programs, services, and resources. The Columbia University School of General Studies (GS) is one of three undergraduate colleges at the University, and is the finest liberal arts college in the United States dedicated to serving nontraditional students seeking a rigorous, traditional, Ivy League education—including those who have served in the U.S. and foreign militaries. GS is home to the largest population of veterans in the Ivy League and is unique as a free-standing college fully dedicated to the complete academic integration of nontraditional students. GS students take the same courses, study with the same faculty, and earn the same degree as all other undergraduates at Columbia University.